I will be picking up from Raw Paws Thursday evening, and from Rodney next Saturday morning. I didn't order a large amount from either, thanks to my recent venison score. 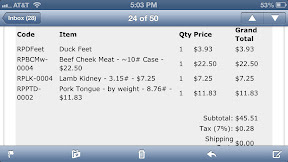 Screenshot of Raw Paws order. The beef cheek meat is slightly over my boneless budget. It's 10 lbs worth. The majority of beef in my crew's diet is heart (along with organs and tripe) so it'll be nice to offer them another cut of beef. The pork tongue was a good price, and I've enjoyed feeding it in the past. The lamb kidneys will offer organ species variety. The duck feet are for fun. I don't need them, but I like to give them as a treat, individually frozen. 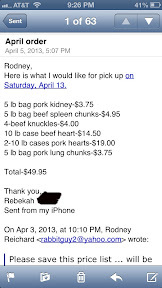 Lots of pork, I just realized. I'll have plenty of "other" organs. I will not be giving the beef knuckles to the woofers to chew on, as I'm fearful of broken teeth. Instead, I'm going to use them to make bone broth, which I will post about. I've fed beef cheek meat before Saya liked it and it was chewy for her from what I remember it was long time ago.